What’s Good For The Portland Trail Blazers This Summer League? You are at:Home»Portland Trail Blazers»What’s Good For The Portland Trail Blazers This Summer League? Simons has impressed on the offensive side of the ball, but it’s been suspected. His range is awesome, as shown above, and it’s a shot I think he can consistently hit in the NBA. He runs the floor incredibly well, reminding me a little bit of Markelle Fultz. One knock on him might be that he tends to keep his eyes to the ground if he’s leading fastbreaks with the ball. At one point he kept himself in the middle of the court against two defenders, instead of running towards the wing and looking for Swanigan on the trailer. Simons lost the ball, but thankfully Swanigan scooped it and passed the ball for the score. Anfernee will eventually learn to avoid forcing these 1 on 2 situations, and get his teammates better involved. Anfernee looks absolutely tiny out there, but he hasn’t shied away one bit from physicality. Given that he hasn’t played high-level basketball for a year, Simons looks great on offense. On the defensive end, he looked a tad lost on some open floor switches, but he’s always got his body on an opponent for a box out. Simons stuck himself on Trae Young moving offball and got a cheap foul on a pump fake. His desire to play defense should be a great sign for a player this young, since not every player cares about defense so much if their offensive game is good enough. It looks like he’ll find himself down in the G-League this upcoming year for more reps, especially with the guard glut that the Blazers have put themselves in, but more on that later. Swanigan has expanded his versatility immensely. Watching his highlights, it looks like the game has really slowed down for him. Swanigan added another dimension to the Blazer offense by being able to put the ball on the floor. He compiled 10 assists over two Summer league games. He’s been able to leverage is body weight better for rebounding. He’s grabbed 21 rebounds in two games and it doesn’t look like there’s another player that can match him on the boards. Swanigan is probably at the point where he doesn’t need Summer League games for development anymore. Since Ed Davis is gone, it seems like the Blazer brass is comfortable letting Swanigan get more minutes. Much was made during the game on how Collins has improved strength-wise which is true, but nobody was really afraid of taking the ball into the lane against him against the Hawks. Collins racked up some blocks, but was consistently roughed up by John Collins. He left the game against the Atlanta Hawks because he bumped knees, but there’s more to desire from Zach on the offensive side of the ball. Don’t fall for the narrative that the Summer League revolves around guard production, when there’s a plethora of big man putting in work around the league. It’s not unreasonable to ask a top ten pick to drop a quick 20 points in Summer League, right? Collins struggled mightily on Saturday against the Utah Jazz, and he didn’t get to attempt a three today. I’ll give him a pass today as it seemed like he was on his way to at least a double-double, but I think it’s wrong to brush his general lack of production under the “he’s-just-a-prospect” rug. 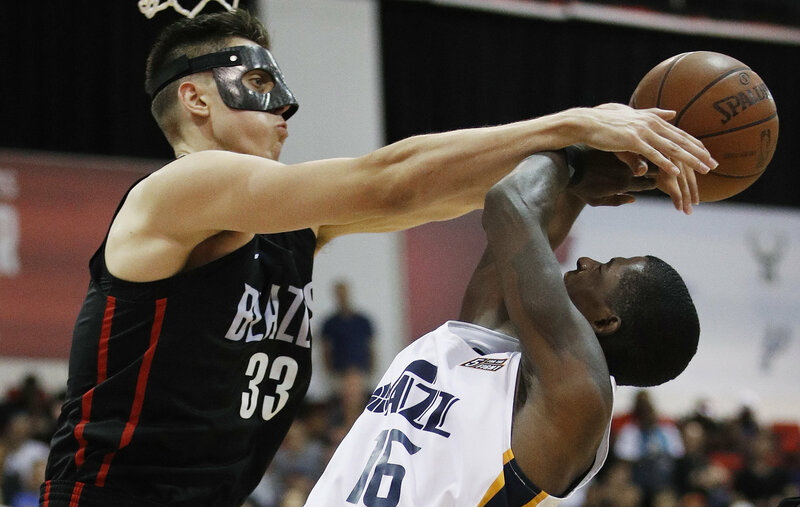 In two games, Zach Collins hasn’t commanded much of anything on offense. He got a couple looks from deep in the Atlanta game, so it’d be nice if he could get some shots up. With his size, he should be able to any shot he wants on the outside. Even on the play where he got injured, there wasn’t really a point for him to put the ball on the floor. Zach needs to be able to make his free throw jumper near automatic. It’s what made Lamarcus Aldridge such an effective player during his time in Portland. Collins also had his moments down low against Atlanta, and he should’ve commanded the ball every time down the court. If he’s improved in strength, why not show it off? At some point, Collins will have to start being a little selfish in order to show off his skill. In a way, it’s a little disappointing seeing Zach shy away from the spotlight when Anfernee Simons just comes in shooting crossover elbow jumpers. Seeing that some other young players are coming into their own offensively at such a young age around the NBA, it’s imperative that Collins starts etching out his own way on the court. If he touches the ball in Summer League, he needs to score. The Blazers have been playing very well during this Summer League, but it’s because a lot of the guys have played NBA minutes this past year. It’s peculiar as to why a player like Wade Baldwin is playing in the Summer League, but maybe the free agent acquisitions of Nik Stauskas and Seth Curry lend insight to where the Blazers are at with guards. Although he’s young, I think he’s shown spurts of being able to hold his own at the NBA level. Baldwin was showing spurts of great play last year, with the Houston game showcasing his potential later in the year. Baldwin already seems good enough for what the Blazers are trying to do offensively. Taking a flyer on Seth Curry probably makes sense, although he’s coming off a tough surgery for a recurring injury. The Dallas Mavericks could’ve easily afforded him, so it might be concerning that the Blazers were able to get him so cheap. Nonetheless, I think Wade is good enough already to get a chance in primary backup rotations. For Summer League games, it doesn’t make much sense to play guys who’ve played heavy NBA minutes, especially from a development standpoint. At the very least, Baldwin and Swanigan don’t need to be playing, and one could make the argument for Zach Collins as well. If you know you have a raw prospect like Simons coming in, don’t you want him playing 30 minutes per game? A lot of these teams are playing NBA players, so it’s not like the Blazers are alone in this. The Dallas Mavericks are playing Dennis Smith Jr., which doesn’t make much sense. It’d be nice to see more minutes from guys like John Jenkins or Georgios Papagiannis. Heck it’d be nice to see what you have further down the bench in guys like MiKyle McIntosh or Langston Morris-Walker. Morris-Walker just finished up a solid season in Sweden and hasn’t played all that much. Wouldn’t it be nice to see what he has to offer before he probably has to go back? You know you can win a Summer League game with Baldwin in the lineup, but is that really the point here? The Portland Trail Blazers take on the San Antonio Spurs on Tuesday.